Kayakers and boaters alike are always pressing for bigger, faster, and gnarlier whitewater to conquer. Some will travel the globe in search of a new challenge, and there’s nothing like staring down the mouth of a huge rapid you’ve never had the chance to run before. There are some killer rivers here in the good ol’ US of A – as well as globally – that have been run where stories are told and legends are made. The technical aspect, location, obstacles and size of a rapid determine it’s classification. The other factor involved is the fear factor. Scouting out a new rapid can either make you want to carry your boat around it whistling to yourself and choose life for today, or…buckle down and shred through what could be the one of the best runs of your life. The following list is 5 of the top whitewater rapids that are kings in their class. The Ghostrider is the final and largest rapid run commercially on the Zambezi river. This Class V rapid has three huge waves that get progressively bigger as you go. Rafts are said to often disappear under the waves for a few seconds at a time. This complex wave train rapid offers any boater a rollercoaster whitewater ride not to soon be forgotten. Grab some plane tickets, and play Toto’s Africa to get you hyped up for the journey. I’ll be back! Or maybe not if you don’t make it through. Supposedly this rapid was named in the 1990’s when a raft went straight into the Terminator hole in the center of the river, thus terminating the trip. The Futaleufú is full of incredible Class V rapids, but the Terminator reigns supreme. This super technical rapid is long as hell, with all the obstacles any crazed kayaker could want. There are huge waves, massive holes and lots of fun boulders to meet. 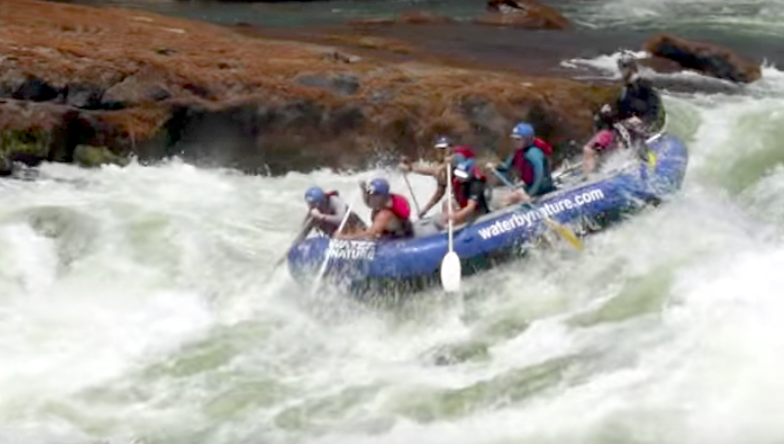 Many pros suggest this is the most challenging commercially run rapid in the world. Let’s get tacos after, yes? We couldn’t make a list of top five rapids, and not mention Pillow Rock and the Upper Gauley. West Virginia, mountain mama, take me home, down a 30 foot wave right into a massive boulder. Here you get to “ride the pillow”, to avoid disastrous results which is how this rapid gets it’s cutesy feel good name. You then get dumped into a trough aptly named “Toilet Bowl”, so you can navigate around Volkswagen Rock. Many boaters stop to hang out along the shores at Pillow Rock to watch the carnage and smooth criminal lines unfold. Well, with a name like God’s House, it’s just got to be good. Boaters head to Nepal after monsoon season when paddling is at it’s best here. The Kernali is located in a remote western region of Nepal, and is certainly not for the fainthearted. Another Class V rapid, God’s House will have you running through a narrow gorge before fighting for your life to avoid a massive hole large enough to swallow a small car, and your pride. You might want to buy some prayer flags to put in your drybag. We’re rounding out the count by visiting our Maple tree and syrup loving neighbors to the north. Bidwell is a S-bend rapid at the start of the commercially run section of the Chilko River. This huge rapid is the start to what’s called paddlers call the White Mile, so this is not a great place to take a little swim. The Chilko will have you paddling 14 miles of the longest Class IV stretch of commercially run whitewater in North America. British Columbia also has the world’s largest hockey stick on display, in case you’re more interested in that. These are just some of the best of the best mother nature has to offer. Whether it’s in West Virginia or Africa, nothing gets the blood pumping like some serious whitewater!